In preparation for my upcoming fairy class, I've been making a small fairies at night out of my naturally-dyed wool stash. Lobster mushrooms, black beans, tansy, bedstraw root, black walnut, st. johns wort, and more make up the fairies resting my bread bowl. It's hard to see in this photo but this girl has the palest blue gown. My daughter claims she's an ice fairy. Not surprisingly I had extra helpers when I was trying to take photographs. Though can they really be called helpers when all they're doing is trying to see if any of that stuff I'm holding is food? Those chirping eggs have turned into chirping chicks. 5 of them so far in the brooder box. One, sadly, didn't make it through hatch but the others are fluffy and peeping like little champs. Interestingly, these guys are white, not yellow, with random dots of black. Their moms were black hens and Carlos the rooster is a mix of white and red so it's strange to see these little soot patches on their white fluff. Sort of like a tiny version of 101 dalmatians. Speaking of speckled fluffies, look how big the ducklings are getting. Every time I wander outside they're underfoot, begging for food. And biting my toes. Even Tiny is growing. And though I tried to give him a good strong name like Thor or Sledgehammer, we keep calling him Tiny. So there we have it, Tiny. I'm done hatching for the year so at some point I'll be back to posting about art. Pretty sure, anyway. I was taken off guard today when my daughter came running in to tell me that the eggs were hatching in the incubator. They were still in the turner and weren't scheduled for "lock-down" until tomorrow, but there they were, chipping and chirping away. For those that haven't experienced it, it's a pretty amazing thing to hold a bowlful of eggs that are chirping at you. When you hold the egg you can feel the little life inside wiggle and then protest loudly through its shell. Wish them luck, hatching is hard work. 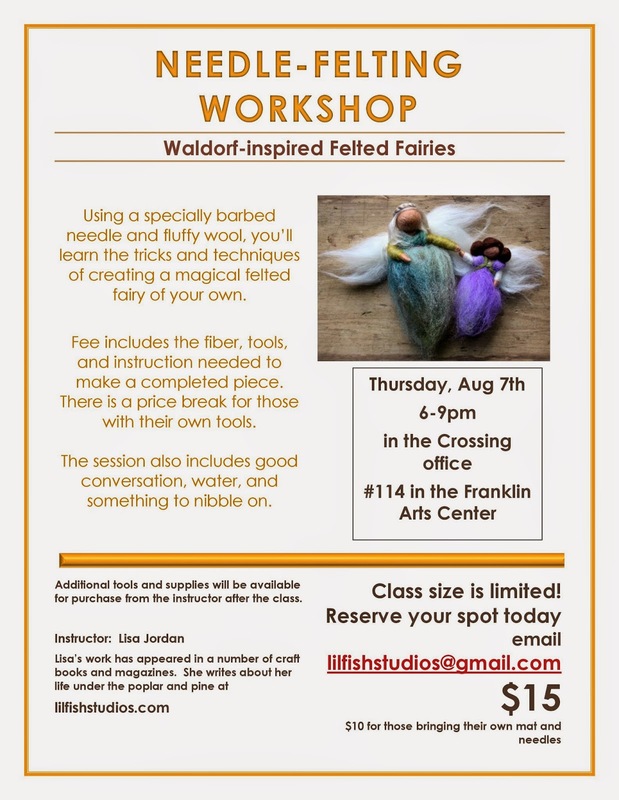 For those of you in my neck of the woods, I'll be teaching a workshop on making pretty little felted fairies on August 7th 2014 from 6-9pm in the Franklin Arts Center, Brainerd, MN. Cost is $15 or $10 for those bringing their own felting mat and needles. Email me at lilfishstudios@gmail.com to sign up or reserve your spot HERE. I'll be teaching fairy-making in a few weeks so I thought some practice was in order. After some jabbing, bending, and taming of fluffy fibers I had a pair of little ladies on my table. Later I found them dancing in my daisies, the dears. For anyone interested in the class, details will be coming soon, but you can also sign up to be notified of workshops as well. Hope you're having a magical weekend. Three new stones in my shop. Headed off to my day job, the last workday before a whole week off. Family coming in to town, fun to be had, relaxing to be done. I sat down to finish that storm stone I showed you yesterday, but when I sat down to put in some stitches I found I wasn't happy with them. Out they came, and out I went, to let the ducklings out for their evening swim. The whole group, happy to be in the water. The first born set of ducklings are getting their white feathers and are entering that adorably awkward-looking phase. They're getting some tail feathers but still have their baby fuzz on their teeny-tiny t-rex arms. Rawr! I will slap you with my t-rex arms! Nope. No you won't, little guy. But nice try. The runt teacup duck is still very small compared to his hatchmates. They look out for him, as if they recognize he needs the extra help. He's very delayed, not only in size but in physical ability, but he's getting more active and growing a little every day. Snack and snuggle time happens after the swim. 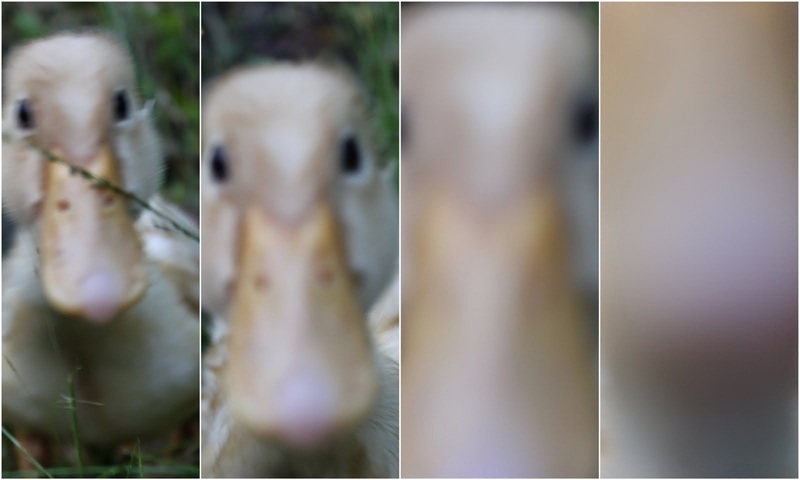 This guy thought for sure my camera lens was food. I was laughing too hard to focus. And if you dare spill food on your lap, you'll have ducks there too. Will it pour purple rain? Sort of sums of my mood. I think my fingers are telling me I need to get into the woods. After finishing that grouping of greens, my fingers were reluctant to put down the sewing needle and I found myself making a stone in purple. Inspired by the iris that have now faded from my garden. Given chips of shell and stone for texture. I'm hoping that one day soon I'll have enough stones finished to do a little shop update. Happy Thursday, all, and happy 4th of July to my American friends.